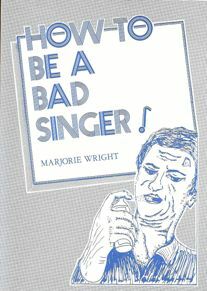 Marjorie Wright, in her unique anecdotal style, de-mystifies the complex art of singing. She explains in detail how to adopt the correct posture, control the diaphragm and breathe naturally. From there it is a short step to tackling the factors that control loud and soft singing and top and bottom notes. She discusses topics such as pronunciation, rhythm and phrasing, and interpretation -“always remember you are telling a story”. Alongside the technical directives she recounts many amusing incidents from her own international career which illustrate and amplify each point. She specialised in contemporary music and devotes a full chapter to the very real challenges that these works present. Finally, there are practical lifestyle tips. Coping with the vicissitudes of travel, quickly assessing the acoustics of a new venue, choosing what to wear, health issues, and so much more. This book is recommended reading for all those embarking on a singing career (whether in classical or popular music) and will prove a real eye opener to listeners with no idea just how much preparatory work lies behind even the simplest sounding song. Q.v. MP's review of Dallapiccola's Ulisse in which Marjorie Wright appears.